Telepresence holds great promise for retail banking, but most early-movers are missing the boat. Rather than reinventing the teller experience, banks should pursue video banking as an omnichannel mechanism to improve customer engagement, according to the new report, “Video Banking: Lights, Camera, Transaction?,” from Celent, an international financial research and consulting firm. Branch foot traffic is declining. No matter how well banks delight branch goers, these consumers are becoming the minority. Banks must learn how to engage customers digitally, while making the branch channel more efficient and effective. Customer expectations are growing. The 8 a.m. to 5 p.m. branch model is inadequate. Banks willing to delight customers with extraordinary convenience and quality engagement will win customer loyalty. Most financial institutions are persistently devoted to legacy retail operating models that are increasingly challenged to deliver the concurrent imperatives of sales growth alongside cost reduction. But some banks and credit unions are building the capability to engage customers in digital channels while enhancing engagement in the branch. That’s where video comes in, and although such institutions are a small minority (at present), but Celent says they’re on the right track. The imperative for branch redesign. In response to business conditions, declining branch foot traffic, and growth in digital channel usage, banks must increase both the efficiency and effectiveness of the branch channel. Video can play a role. Consumer acceptance. Once primarily a business application, mass market usage of video is burgeoning. Its appeal extends well beyond Gen-Y. Customer engagement. As more customer interaction occurs in digital media, banks must devise ways of engaging customers digitally. Banks can no longer afford to view digital channels simply as a mechanism for low-cost transactions. Video and chat can play a role. Solution viability. Modern video alternatives are light years ahead of earlier solutions, improving efficacy at a much lower cost than before. Video Tellers. Video is being used at drive-through locations and in branch lobbies and vestibules alongside transaction automation technology to provide a potentially lower-cost alternative to the traditional teller experience. Video SMEs. In contrast to using video to support routine (teller) transactions, some banks and credit unions are using desktop video conferencing applications to connect customers with subject matter experts (SMEs) such as lending officers and specialized customer support personnel. Only a handful of banks have used video to augment existing digital channels. Who’s Using Video Banking Today? Cisco says that when video is implemented across the entire branch footprint and multiple products and services are offered, the benefits outweigh the cost exponentially. With video integration in branches, retail banks can virtualize their pool of experts and make them available to more branches in their footprint, at a lower cost. According to Cisco, consumers are interested in the ability to interact with their banker via video: 47% in developed countries and 78% in emerging markets. Cisco says the average mobile user made at least one video call per month in 2012, and by 2017 they predict that number will climb to at least five. 32% of those surveyed use a webcam and video chat program to communicate with friends or family at least once a month. Tomorrow’s banking interactions will occur between bankers on tablets and consumers on mobile phones (or vice versa). Exchanges will take place through apps, text chats, voice conversations and two-way video. But everyone will be on a mobile device, and completely untethered. In the meantime, we’ll have to get by with what consumers can handle and what’s on the market technology-wise today. Last fall, uGenius Technology (now owned by NCR), launched a new online video banking solution that enables financial institutions to engage with customers remotely any time, anywhere using a video-capable computer. With uGenius Online Video Banking, financial institutions can have an expert available 24/7 to discuss new accounts, loans, investments, mortgages or other high-value services with consumers. Using any video-capable computer, such as a laptop or home computer, a consumer can initiate a call from a bank or credit union website. Then experts can answer questions, resolve issues, help compare products, close loans and other consultative activities. All financial transactions conducted via the uGenius Online Video Banking interface are completely secure. In addition to authenticating the identity of each customer, uGenius also provides an encrypted transmission of all information as well as a two-way text chat for sending confidential information in a public setting. Conestoga Bank ($590 million) was an early adopter of the uGenius video banking solution. “It’s more than an ATM with a video. You can walk into an office and access the back office people, or talk to an SBA lender or a mortgage specialist. We’ll be able to deliver these services to people remotely at virtually no cost,” Elko explained in an interview with American Banker. Elko’s solution: video banking. Conestoga rolled out a new branch design dubbed Bankwerx centered around video — both for transactions and consultative interactions. By consolidating tellers and service reps at a central “video banking call center,” Elko expects he’ll be able to trim branches from 3,500 square feet down to about 1,500. Canadian credit union FirstOntario has been experimenting with video tellers since 2010. They say it takes people a little while to get comfortable with remote banking video conference technology. Surprisingly, seniors have taken to FirstOntario’s video banking solution more so than younger people. Most people are content to use regular ATM machines, but elderly patrons found FirstOntario’s video system more familiar than an impersonal computer screen. Hoag-Smith thinks elder members embraced the technology because there’s a real person behind it who can ensure they don’t make any mistakes in their banking. It’s a good theory that makes sense. Cisco agrees that adoption of web-based video in consumers’ personal lives or at work isn’t limited to younger tech- savvy consumers. Cisco IBSG’s study indicates that Gen-X are also solid believers in video’s current capabilities and future potential. Diebold has a solution very similar to the one from uGenius. Last October, Missoula FCU ($385 million) began pilot testing Diebold’s video technology at its ATM. 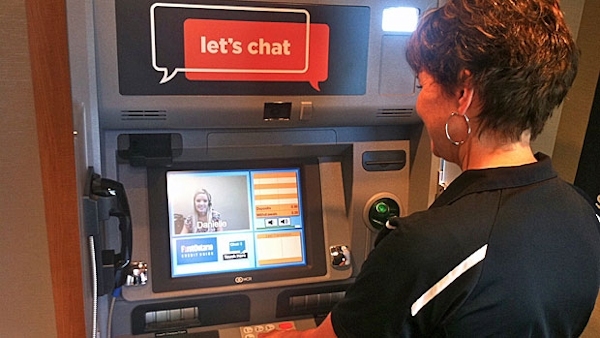 These video-capable kiosks enabled the credit union to visually connect with members to answer questions, discuss products and process any transaction that someone could conduct via the call center or ATM. According to Diebold, their Concierge Video Service lets financial institutions transform the self-service channel in three key ways: enhanced consumer service, expanded access to financial services experts and advanced targeted marketing efforts. Mountain America Credit Union ($3.6 billion) is giving Diebold’s video system a whirl as well. Now with Concierge Video Services, Mountain America members can address issues that have historically been impossible at ATMs (e.g., account updates and maintenance). Immediate access to support at the ATM saves consumers time and can facilitate dialogue around additional products and services that might otherwise not have happened.